Gwynfor Growers DO provide mail ordering. Visitors to Gwynfor will receive a warm welcome. We can guide you round or leave you to wander at leisure through our outdoor and undercover areas. 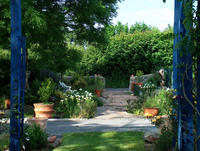 For sale are plants to intrigue and delight: delicate, dramatic, classic or contemporary. Choose from fine herbs, grasses, ground cover, choice perennials and scented shrubs. Many of our plants are rarities sourced from National Collections. Rare Welsh Fruit Trees, including the famous Bardsey Apple and Denbigh Plum.